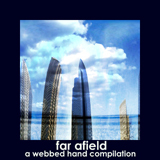 Far Afield is a fascinating soundscape compilation album which is free to listen to and download from the Internet Archive. Similar to the Birdsong DAB radio station that I’ve mentioned in the past, Far Afield consists of field recordings of sounds from both natural and artificial sources. But the recordings don’t turn out as walls of random noise because the recordings are specifically focused around using the rhythms and melodies as focal points. The results that I received were astounding. The tracks represent everything from highly composed tracks telling stories or capturing the essence of far away locales to straight field recordings that the artist felt did not need any processing to demonstrate the beauty of the situation. Cracking ice on a lake, cicada songs, rusty gates, dripping water, moving trains, and a handful of other captured sounds provided the instrumental palettes for these compositions. Many thanks are to be given to the artists who accepted this challenge to coax such delightful music and beauty out of unplanned and un-orchestrated events. It’s well worth downloading this CC-licensed album, putting it on your iPod and having a listen. In our daily routines: the commute to work and the incessant ringing of the phone in the office, we’re all too used to hearing the same sounds again and again. Far Afield can immerse you in an altogether different place. Two fantastic visualisations of emotion today which may serve as inspiration for some of art, writing or perhaps even webpage designs. 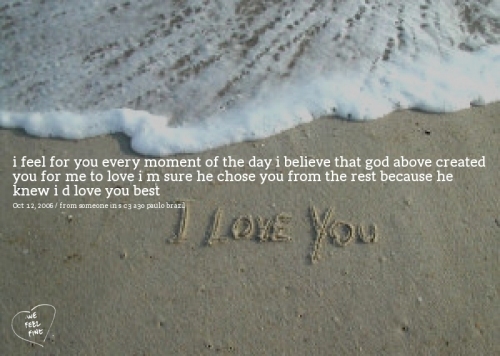 We Feel Fine scours the internet for human feelings every ten minutes. According to their website, they use sources “including LiveJournal, MSN Spaces, MySpace, Blogger, Flickr, Technorati, Feedster, Ice Rocket, and Google”. They then analysewhat is written in the blogs for “I feel” or “I am feeling” and do further analysis/crawling around the website to pick up information on the type of feeling which is being felt as well as the age and geographical location of the author. 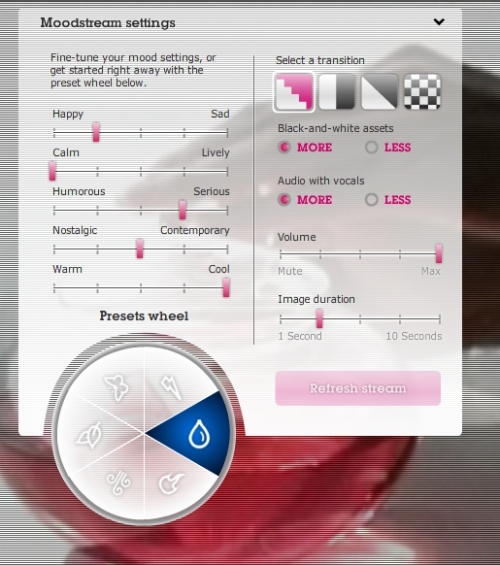 The applet on the website then generates a “emotion cloud”. Try it out. Moodstream is a visual brainstorming tool. Choose from 6 presets or select your own from various parameters such as happy/sad, calm/lively, humourous/serious, nostalgic/contemporary, warm/cool. 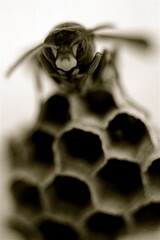 The applet finds music, images and videos and combines them to deliver that image. It’s designed to be a take you in inspired and unexpected directions. Personas for Firefox is a really nice extension for Firefox which adds lightweight theming without having to restart your browser. I’ve been using it several months now and it’s really nice so I really recommend having a look. There are a dozen Foxkeh themes which are pretty cute too. Personas was recently updated so the theme could be dynamic web content. People have started to play around with this feature: for example theming the browser with a live webcam from Germany. Find out how to create your own Personas. 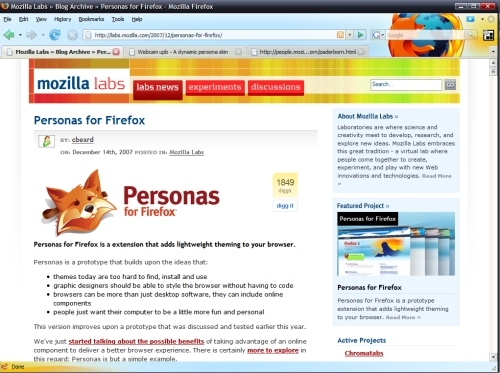 The team hope to release the final version of Personas in time for Firefox 3. The Google Mail Trend Visualiser is pretty cool. It’s a Python script which connects to your Gmail account using IMAP and then produces some pretty graphs, tables and distributions on information such as who is emailing you, subject lines, mailing lists and so on. Check out the example output for the Enron e-mail dataset and if you’re interested, have a look at the getting started guide. I’ve tried installing this but so far no luck… I get “ImportError: No module named utils” but I’m running Python 2.3 on Windows… your mileage may vary.